There is something deeply alluring and mesmerizing in the almost oriental sounding voice of the singer on this small release by Rose Croix, brought to us by the Ever brave mysteries label. Her vibrating chanting goes in and out of focus, as the magical orchestra behind her pulses with heavy sounds of pipe organs and deep, enchanting drones. This witching experience takes us to cavernous chambers as Rose Croix plays hollow tones that resonate endlessly in beautiful loops. “III” catches my attention with the distressed, urgent sirens that rise and fall around the towering, amazing singing. It then fades into IV, which is more ghostly part of the album. This rather long track, over ten minutes long, begins with a slow prayer, which then takes new skin and form a trance inducing beat that we can hear from the early Tangerine dream, in an alternate universe where they do dirges and laments instead of the music they made on our dark world. 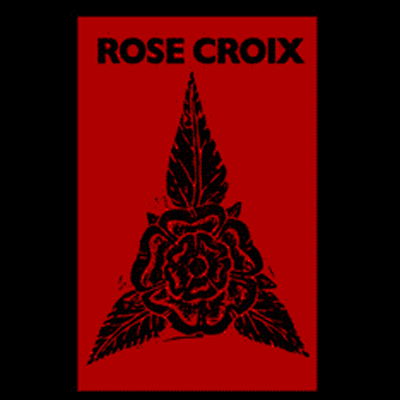 Rose Croix hovers gently, part ethereal, part wild and carnal. Somewhere between the uplifting, majestic nobility and the hidden hand witchery, these five tracks stimulate the senses with their sharp electronic bites and caressing, even if a little poisonous, singing. This fine order of beautiful, thorny roses and balanced occultism is, besides standing in it’s own impressive light, another fine example for the great line of artists and albums that come through the brave mysteries that are sitting out there in Wisconsin USA. Check them out.